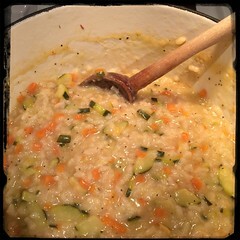 This wonderful risotto takes on a light and colorful tangent by using green zucchini and carrots (which help to give more orange color). 1. Heat 2 or 3 tbsp olive oil in a dutch oven and sauté the shallots (or onions and garlic) until translucent. 3. Add the Arborio rice, mix well until all grains are coated with the butter and oil and cook until the grains absorb the liquid and you can begin to smell the rice toasting. 5. Add the cup of white wine and allow the rice to absorb it, stir frequently. 7.Following the procedure, add the stock 1 cup at a time and wait for the rice to absorb before adding another cup. 8. Before the last cup of broth add the Pecorino Romano. 9. Add last cup of broth and cook until the risotto is as to the consistency of your liking, taste and salt and black pepper until you’re satisfied.